Home » advice , aircraft carrier , compensation , cv , doubloons , fxp , refunds , rework , update , world of warships » World of Warships 0.8.0 CV Rework: Compensation and Refunds, How it Works! 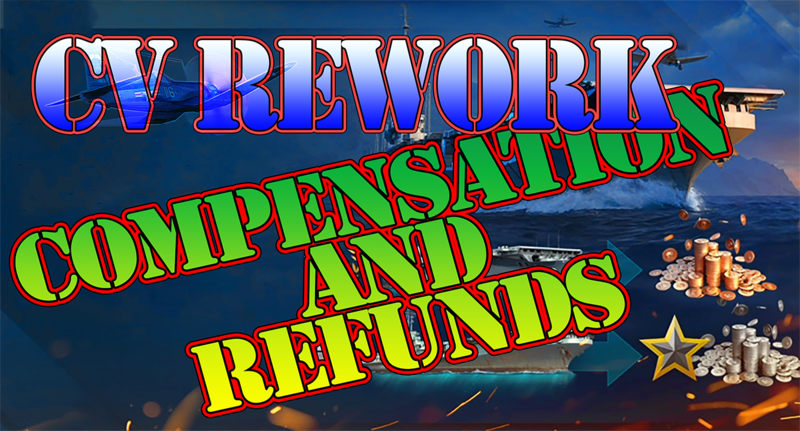 World of Warships 0.8.0 CV Rework: Compensation and Refunds, How it Works! CV Rework: Compensation and Refunds, How it Works! With only 2 weeks until this massive change in the game hits the live servers, compensation and refunds are what some players will be seeking. With the release of new aircraft carriers all players who have researched current CV tech tree lines will be compensated for the difference between two even or two odd levels of aircraft carriers with free XP and credits. The accumulated XP remains on the current ship, or is moved to the ship that has replaced the previous one. Researched modules are replaced with similar ones for new aircraft carriers. If a module has already been purchased, a similar module is added to the new ship. The ship is equipped with modules similar to those that were mounted on the old ship. If this is not possible, a stock module is mounted. The detailed rules for ship exchange are provided below. 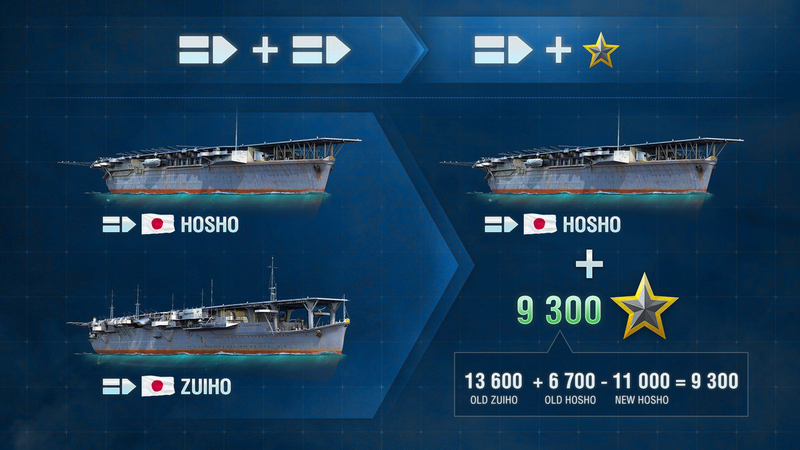 In case an aircraft carrier doesn't have similar modules, the XP spent on researching them is compensated for by an equal amount of Free XP, as well as the full cost in credits if the module was available on the account. If all modules were researched on the old aircraft carrier, the new aircraft carrier will also have all modules researched, even if she has some additional new ones. All accumulated XP will be transferred to an aircraft carrier one tier lower. All XP spent on unlocking modules is compensated for by an equal amount of Free XP, as well as the full cost in credits if the module was available on the account. All upgrades installed on aircraft carriers, including unique ones, are removed and moved to your Inventory. Upgrades that can only be installed on aircraft carriers are offset by their full cost in credits. All the commanders of aircraft carriers of even tiers retrain and move to new aircraft carriers of even tiers. All the commanders of aircraft carriers of odd tiers retrain on the new aircraft carriers at a lower tier and are moved to the Reserve. All aircraft carrier commanders reset their skills. All the permanent camos of carriers on even tiers are replaced with similar permanent camos with the addition of new aircraft carriers from even tiers. All permanent camouflages of odd tier aircraft carriers are removed and compensated at the full cost in doubloons. The exchange can be carried out strictly from high-tiered ships downwards. E.g., you cannot convert Ranger without converting Midway and Lexington first. During conversion, a ship will be removed from your account with all of its modules. In exchange, your account will be credited for the cost of the ship, including all of its modules, in credits as well as Free XP, to an amount sufficient to research the ship and all previously researched modules. Credits and Free XP will be calculated using a new system, taking into account the absence of ships at odd Tiers of the branch. Aircraft carriers can be exchanged more than once. But all subsequent operations will convert the XP used for researching the ship and its modules across to the associated XP of the ship one Tier below. If you exchange Tier IV carrier, starting with the second operation of this kind, the associated XP will be transferred to Tier I ship. All Commanders specialized to for a particular ship that you wish to convert will be retrained and reassigned to a Tier I ship of the relevant nation. Any associated XP earned by a ship that is to be converted will be transferred to a Tier I ship of the relevant nation. Upgrades, consumables, signals, flags, and expendable camouflage patterns will be removed from ships and transferred to the Inventory. Permanent camouflages will be compensated for by their full price in doubloons. Slots are not removed from accounts following ship exchange. Once a ship is converted, she can be researched anew. 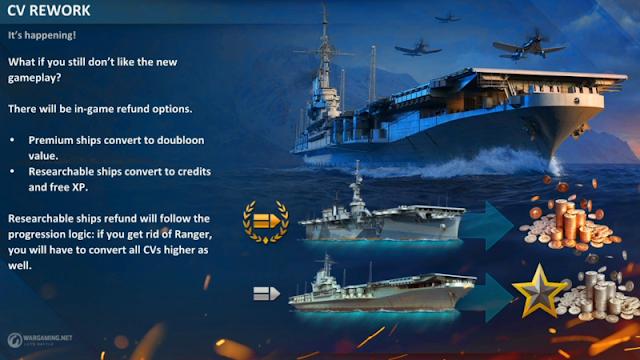 When a Premium carrier is converted, players’ accounts will be credited for the cost of the carrier in doubloons. This is the cost at which the ships were offered for sale initially. Attention! These ships cannot be purchased before the release of Update 0.8.2. With the release of the update, or at a later date, the ships will be made available for purchase again, but at a new cost which is 14,000 doubloons. Keep this change of price in mind, because if you convert any of these ships at this point, you may fall short of the necessary doubloons to purchase them back later! Detailed information about the methods of exchange will be covered in the final patch notes before the full release.